This report was elaborated by Francisco J. Rivera Juaristi. 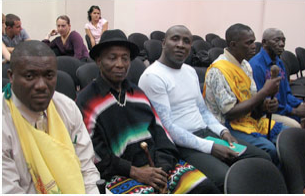 On November 23, 2011, the Inter-American Court of Human Rights issued an order supervising Suriname’s compliance with its November 28, 2007 judgment on preliminary objections, merits, reparations, and costs, and its August 12, 2008 interpretation judgment in the Saramaka People v. Suriname case. The case involves indigenous land rights, including issues such as free, prior, and informed consent, environmental and social impact assessments, and the right to the collective recognition of their juridical capacity. 2) The duty to abstain, until the first obligation has been fulfilled, from acts which might affect the existence, value, use, or enjoyment of Saramaka territory without consent; and the duty to review concessions already granted within traditional Saramaka territory. The Court noted that despite its repeated requests, the State has not adequately reported on the measures taken to review concessions existing in Saramaka territory prior to the issuance of the Judgment, nor on the alleged upgrades to the Afobaka road in Saramaka territory or the logging and mining concessions allegedly granted in Saramaka territory after the Judgment was served. The Court did note, however, that according to the representatives, the adverse impacts of such concessions include the destruction of farming areas, extensive pollution of air and water sources by mining waste, the usurpation and denial of Saramaka ownership rights over those lands and resources, and the denial of their right to effectively control their traditional territory. Moreover, the concession was allegedly issued without the completion of a prior and independent environmental and social impact assessment and without the institution of effective mitigating measures. Additionally, the State had apparently issued a land title within Saramaka territory on 16 July 2010 in the name of a private company for the purpose of maintaining a tourism resort, without effectively consulting with the Saramaka people. 3) The duty to ensure that environmental and social impact assessments are conducted prior to awarding a concession for any development or investment project within traditional Saramaka territory, and to implement adequate safeguards in order to minimize the damaging effects such projects may have upon the social, economic, and cultural survival of the Saramaka people. 4) The duty to legally recognize the collective juridical capacity of the members of the Saramaka people; to amend or remove legal provisions that impede the protection of the victims' right to property and to implement legal and other measures necessary to ensure their right to hold collective title; to adopt legislative, administrative, and other measures necessary to guarantee the right of the Saramaka people to be consulted, or when necessary, the right to give or withhold their consent, with regard to development or investment projects that may affect their territory, and to reasonably share in the benefits of those projects; and to adopt legislative, administrative, and other measures necessary to provide the victims with adequate and effective recourses against acts that violate their right to the use and enjoyment of property. 5) Duty to translate into Dutch and publish Chapter VII and Operative Paragraphs one through fifteen of the Judgment in the State’s Official Gazette and in another national daily newspaper. 6) Duty to finance two radio broadcasts, in the Saramaka language, of parts of the Judgment, including Operative Paragraphs one through fifteen, in a radio station accessible to the Saramaka people. 7) Duty to allocate the amounts set in the Judgment as compensation for pecuniary and non-pecuniary damages in a community development fund created and established for the benefit of the members of the Saramaka people in their traditional territory. The Court decided to convene a private hearing during the year 2012, on a date to be decided. The State’s next periodic report is due on March 30, 2012. It is worth noting that, following a very recent trend, Judge Diego García-Sayán and Judge Eduardo Vio Grossi added separate opinions to this order. The first time a Judge added a concurring opinion to an order monitoring compliance with a judgment was as recently as November 18, 2010 in the Bámaca Velásquez v. Guatemala case (Judge Vio Grossi). The second time it happened, it was also Judge Vio Grossi in a July 5, 2011 order in the Bueno Alves v. Argentina case. In the November 2011 sessions, both Judges García-Sayán and Vio Grossi issued one separate opinion each and proceeded to attach the same opinion to the three separate orders monitoring compliance in the following cases: Saramaka People v. Suriname (this one); Servellón García et al. v. Honduras and Blanco Romero et al. v. Venezuela. In these separate opinions, Judges García-Sayán and Vio Grossi analyze what they believe to be the Court’s duties under Article 65 of the American Convention to inform the General Assembly of the OAS about cases in which a state has not complied with the Court’s judgments. In his separate opinion, Judge García-Sayán evaluated the effectiveness of the procedure by which the Court currently monitors compliance with its judgments. He highlighted that hearings have been held for that purpose since 2007, and that this tool – the hearings – has become a vital and successful mechanism to guarantee compliance with its judgments. Additionally, Judge García-Sayán explained that Article 65 of the Convention orders the Court to specifically point out to the General Assembly – without much commentary or analysis – the cases in which a state has not complied with its judgments, so that the latter may act in its capacity as collective guarantor of the Inter-American system. According to Judge García-Sayán, this duty is limited to those exceptional cases in which a State’s effective reluctance or refusal to comply with a judgment is proven. In this Saramaka People case, as in most other cases, this threshold has not been met, and the current mechanisms have proved to be effective. Judge Vio Grossi concurred with the order, particularly in light of the extended amount of time elapsed since the issuance of the judgments in this case without the State having complied with its fundamental orders. His analysis of the Court’s duties under Article 65 of the Convention (and Article 30 of the Court’s Statute) differs somewhat from those of Judge García-Sayán. According to Judge Vio Grossi, these norms establish an imperative “strict obligation, and not a power, for the Court” to indicate to the General Assembly the cases in which a state has not complied with the decisions of the Court in the corresponding year. As such, the Court’s annual report should include an indication of “those cases, such as the one at hand, in which not only has the established deadline [for compliance] expired, but too much time has passed, more than what could be considered prudent or reasonable, without the State having complied with the Judgment’s fundamental aspects.” For Vio Grossi, an inclusion, in the annual report, of a list of the cases in proceedings for monitoring of compliance or the attachment, as annexes, of the orders issued, does not meet the Court’s obligations under Article 65. Fuente de la fotografía: http://www.tooka-move.net/english/e-1aktuell.html.